Watford striker Odion Ighalo has dismissed speculation linking him with a move away from Vicarage Road. The Nigeria international has scored 14 Premier League goals this season and, according to the Sun, has attracted interest from Atletico Madrid. "I want to finish the season strongly with Watford and prove that we have a good bunch of players here," the 26-year-old told BBC Sport. "When the focus is on a strong finish, transfer talk will not get to you." 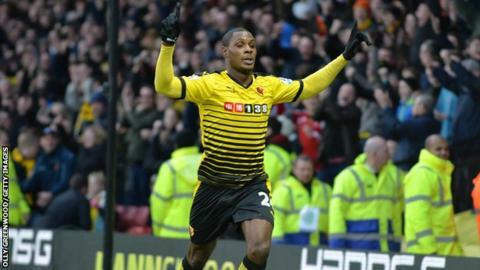 Ighalo, who joined the Hornets from Udinese in 2014, scored more goals in English league football than any other player in 2015. And his tally of goals in the 2015-16 Premier League is bettered only by Leicester's Jamie Vardy and Romelu Lukaku of Everton. "I haven't really bothered myself about statistics because I've always had my feet on the ground and I never forget where I come from," Ighalo said. "I am just focused on getting better, doing things right on the pitch and being myself on the pitch." Ighalo's goals have helped lift Watford to ninth in the Premier League on their return to the top flight. "Watford are doing well at the moment because we have a fantastic team and not because of one particular player," said Ighalo, who has also had spells in Norway and Spain. The Hornets were beaten 2-1 by Tottenham last time out and host Manchester City on Saturday (17:30 GMT). "We didn't get the result we deserved against Tottenham but we want to put that right against Man City - that's what is in front of me right now," added Ighalo. "It's a new year in front of our fans, I want to keep scoring for my team and fight hard alongside my team-mates."